The HAVIT HV-MS995GT gaming mouse is a great little gaming mouse for those who want to be free of wires. The design feels good in the hand, it has the usual left/right and scroll wheel buttons on top along with two buttons that, by default, change the DPI setting. When you change DPI setting the mouse light changes colour so you can check what you’ve got it set to. On the left hand side are a couple of buttons that, by default, go forward/backward in a browser. All of these functions can be changed if you install the included drivers. At the time of review I couldn’t find these drivers on the Havit website so be aware you’ll need access to a CD drive to install the software. The mouse connects via an included USB dongle and when not in use this can be stored in the underside of the mouse. There is a USB cable included to charge the mouse, it plug in at the front, in between the left and right buttons. The mouse feels good in the hand, it’s a nice shape and I like the textured side sections. 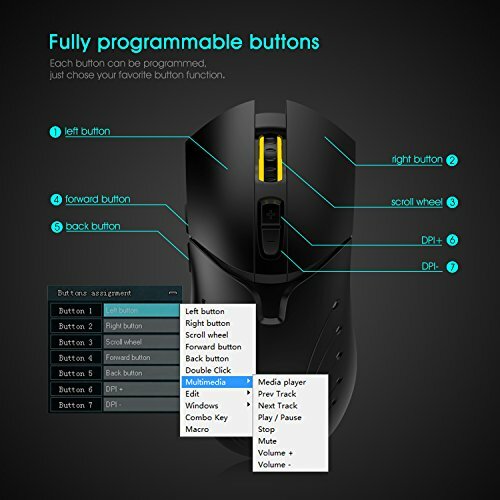 It’s a little lighter than I’m use to, but if you are using this as a travel mouse perhaps that is a plus point for you.